It's about that time again... Pi(e) Day Time! Last year we had a wonderful celebration of the House of Representatives-decreed March 14th holiday at St. Stephen's Church benefiting Radio CPR. 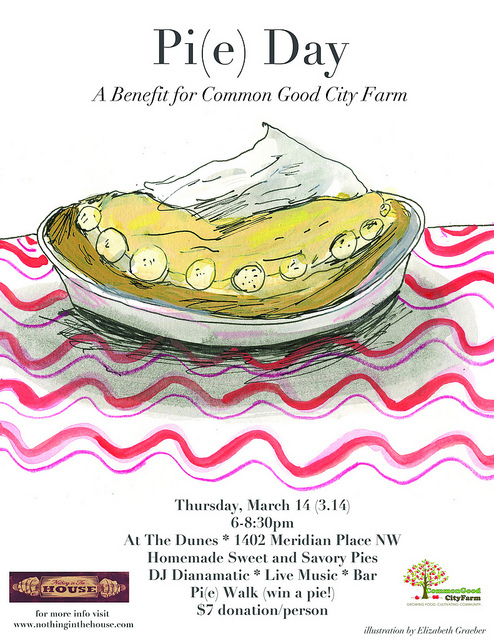 This year, we're switchin' things up a bit with a Pi(e) Day party at The Dunes to benefit Common Good City Farm, a community-based urban farm in D.C.
Pi(e) Day festivities will include a vast selection of sweet and savory pies donated by a team of home bakers (get in touch if you're interested in contributing), a Pi(e) Walk (walked in circumference of 2piR) where you can win a pie to take home, French pop and soul jams by DJ Dianamatic, live music, and a new addition this year of a full bar! There will also be copies of The Runcible Spoon and PIE. A Hand Drawn Almanac for sale. All of that for a donation of just $7. Find more details via the Facebook event here. We're still compiling our menu, but the list is looking promising so far with an Aztec Chocolate Chess Pie, Nectarine, Mascarpone & Gingersnap Tart, and a Bourbon Bacon Pecan Pie. If that hasn't sold you, check out some photos, words and videos from Pi(e) Days past here. Labels: pi day, Washington D.C.